Motile bacteria sense the presence of chemicals and respond by moving in a certain direction—a phenomenon called chemotaxis. If a compound is a nutrient, it may serve as an attrac-tant, enticing cells to move toward it. On the other hand, if the compound is toxic, it may act as a repellent, causing cells to move away. The movement of a bacterium toward an attractant is anything but direct (figure 3.40). When E. coli travels, it progresses in a given direction for a short time, then stops and tumbles for a fraction of a second, and then moves again in a relatively straight line. But after rolling around, the cell is often oriented in a completely different direction. The seemingly odd pattern of movement is due to the rotation of the flagella. When the flagella rotate counterclockwise, the bacterium is propelled in a forward movement called a run. The flagella of E. coli and other peritri-chously flagellated bacteria rotate in a coordinated fashion, forming a tight propelling bundle. After a brief period, the direction of rotation of the flagella is reversed. This abrupt change causes the cell to stop and roll, called a tumble. Movement toward an attractant is due to runs of longer duration that occur when cells are going in the right direction; this occurs because cells tumble less frequently when they sense they are moving closer to an attractant. In contrast, they tumble more frequently when they sense they are moving closer to a repellent. 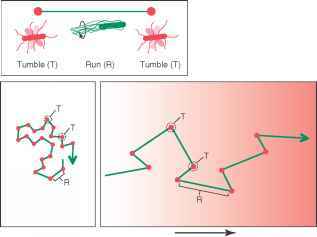 Figure 3.40 Chemotaxis (a) Cells move via a random series of short runs and tumbles when the attractant or repellent is uniformly distributed. 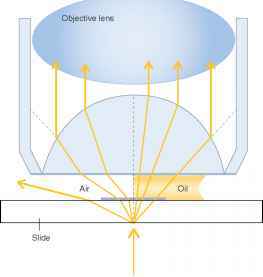 (b) The cell tumbles less frequently resulting in longer runs when it senses that it is moving closer to the attractant. 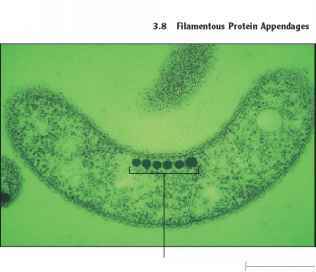 Figure 3.41 Magnetic Particles Within a Magnetotactic Bacterium The chain of particles of magnetite (Fe3O4) within the spirillum Magnetospirillum (Aquaspirillum) magnetotacticum serve to align the cell along geomagnetic lines (TEM). teria that grow only in its absence tend to be repelled by it. Certain motile bacteria can react to the earth's magnetic field by the process of magnetotaxis. They actually contain a row of magnetic particles that cause the cells to line up in a north-to-south direction much as a compass does (figure 3.41). The magnetic forces of the earth attract the organisms so that they move downward and into sediments where the concentration of oxygen is low, which is the environment best suited for their growth. Pili are considerably shorter and thinner than flagella, but they have a similar structural theme to the filament of flagella—a string of protein subunits arranged helically to form a long cylindrical molecule with a hollow core (figure 3.42). The functions of pili, however, are distinctly different from those of flagella. Pili also appear to play a role in the movement of populations of cells on solid media. Twitching motility, characterized by short, jerking movements, and some types of gliding motility, characterized by smooth sliding motion, involve pili. Figure 3.42 Pili (a) Pili on an Escherichia coli cell.The short pili (fimbriae) mediate adherence; the F pilus is involved in DNA transfer. (11,980x). 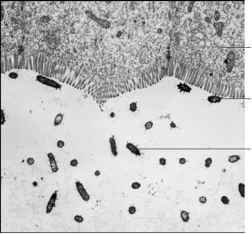 (b) Escherichia coli attaching to epithelial cells in the small intestine of a pig.